It’s another live episode of Sound Bites, our weekly show exploring the future of the food system. Charles Wright, owner of the Wright Family Farm in Wicomico County, MD, and Ted Wycall, third generation farmer at Greenbranch Farm in Salisbury, MD, join us for a farmer’s roundtable. Then, we hear an update on Brickyard Educational Farm in Montgomery County, MD, from Sophia Maravell, Education Coordinator at the Farm. We close out Sound Bites with one of our favorite segments: a weekly recipe! 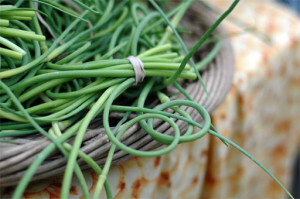 This week, Kristen Carbone of Radix Farm in Upper Marlboro, MD, shares her recipe for garlic scapes, using the “flower stalks” of hardneck garlic plants. We end the show with Laila El-Haddad and Maggie Schmitt, authors of The Gaza Kitchen: A Palestinian Culinary Journey, who join us from Dar al-Taqwa Islamic Center in Ellicott City to talk about their new cookbook. With 120 kitchen-tested recipes and documentary photography, the authors provide rare insight into Gaza’s culture and cuisine, revealing how conflict and siege play out in the daily lives of ordinary people. Part cookbook, part political analysis, part history, this award-winning book will open your eyes to Gaza like never before.